Hey, Adam, invent a game of chance native to Ur-Hadad, and a mechanic for resolving it, preferably opposed rolls. Sure thing, man. Here goes. And Edgar, I'm taking you quite literally here. Death's Will is a dice game for two players, most often played for low stakes in Mustertown taverns like the Soiled Dove and by bored soldiers in Ur-Hadad's Spearmarket (and all too often by on duty guardsmen). To play Death's Will, the gamblers need a bowl and three dice (the type of dice used are determined by the stakes of the game, see below). Mankind learned Death's Will at the feet of his Elder Race masters over a millennium ago continues to play it to this day, a fact that is as much a testament to the game's simplicity as it is Man's enduring greed. 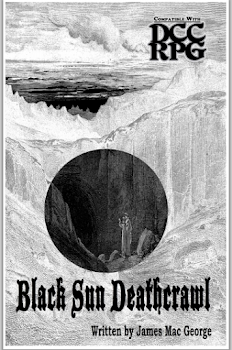 Many players believe that the name "Death's Will" comes from the fact that the Elder Races played the game in the specially-prepared brain pans of human skulls, the previous owners of which had been slain in sacrifice to some forgotten deity of chance; the true initiate of the game's deeper mysteries eventually learns that the game instead derives itself from a belief that the dice reveal the will of the Chaos Lord Slalocteclotl, Keeper of Vaults and Jailer of the Damned, who jealously guards the wealth of the dead. In great Ur-Hadad, a secret shrine to Slalocteclotl serves the wealthiest degenerate masters of the game as both the temple of the obscure Chaos Lord and the highest-stakes gambling hall in the world. Death's Will is played in turns, starting with the "challenging" player, who is usually the player who does not own the dice or the bowl (the owner of the accouterments is the "house"); the challenger pays the ante (which varies, see below) and then rolls the three dice into the bowl. The players note whether the challenger has scored or not (or experienced another special roll; see "Scoring," below) and then play passes to the house, who then antes and rolls. If players fail to roll a score on their turns, they may continue to alternate turns until each has a score; if one player fails to get a score, he can continue to ante and reroll, even if the other player already has a score. When both players have a score, the hand is over and the player with the higher score is declared the winner and takes the pot of coins paid as ante. 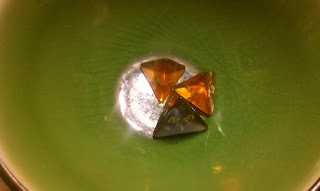 A roll scores when two of the dice show the same value; the value of the third die is the score. Thus, if a player rolls "2," "2" and "3," his score is "3." Rolling triples is a special score, as described below. Plague - A plague is rolled if a player rolls a "1" on each of his dice. Rolling a plague means an automatic loss by the player rolling it. Play immediately stops when a plague is rolled, whether both players have scores or not. 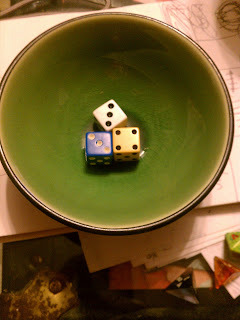 Woe - A woe is rolled if a player rolls "1," "2" and "3" on his three dice. Rolling a woe means an automatic loss by the player rolling it and also forces him to ante twice more after rolling. Play immediately stops when a woe is rolled, whether both players have scores or not. Weal - A weal is rolled if a player rolls the three highest consecutive values on his three dice; for example, "4," "5" and "6" if six-sided dice are being rolled or "2," "3" and "4" if four-sided dice are being rolled (the type of dice is decided based on the stakes of the game, see "Stakes" below). Rolling a weal means an automatic win by the player rolling it and forces the opposing player to ante twice after the roll. Play immediately stops when a weal is rolled, whether both players have scores or not. Piss - A piss is rolled when at least one of any player's dice falls out of the bowl when being rolled. Rolling a piss results in no score and play continues normally. The other player is encouraged to mock the pisser. The stakes of the game determine both the denomination of the ante and the dice used to play the game. Before play begins, players must decide on the stakes of the game. Low Stakes - Also called "penny ante" stakes, the ante for a low stakes game is a single copper piece. 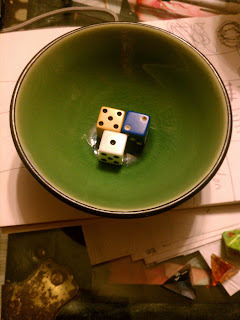 The dice used in low stakes Death's Will are four-sided (d4s). Average Stakes - Also called "bit" stakes, the ante for an average stakes game is a single silver piece. 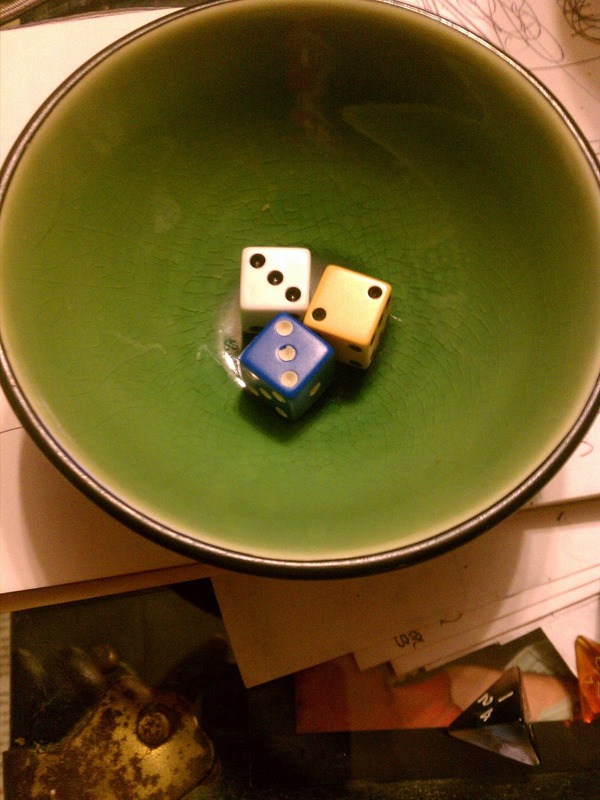 The dice used in average stakes Death's Will are six-sided (d6s). 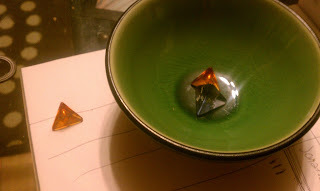 High Stakes - Also called "crown" stakes, the ante for a high stakes game is a single gold piece (!!!). The dice used in high stakes Death's Will are twelve-sided (d12s). During any ante, a player may call for a raise, increasing the ante by any number of coins of the sort determined by the stakes. Usually, a raise will be called for at the beginning of a hand to make the game more interesting. Crag Beerbeard is sitting down to a modest seventh tankard of ale when he discovers that Old Soily has a Death's Will game running in one corner of the Soiled Dove. The surly dwarf decides that beer number eight is his lucky one and goes all in on an average stakes game with Soily. Crag antes up the silver piece necessary to buy in to an average stakes game and then rolls his three dice, which come up "1," "2" and "5," leaving Crag with no score. 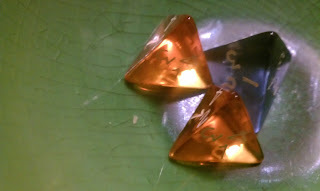 Next, it's Soily's turn; he antes his silver and rolls his dice. Soily fares a little better than Crag, rolling "2," "3" and "3." The two "3s" indicate that Soily has scored and the third die is read for that score. Soily has obviously scored a "2." Crag antes up for another roll, confident that he can beat Soily's 2. 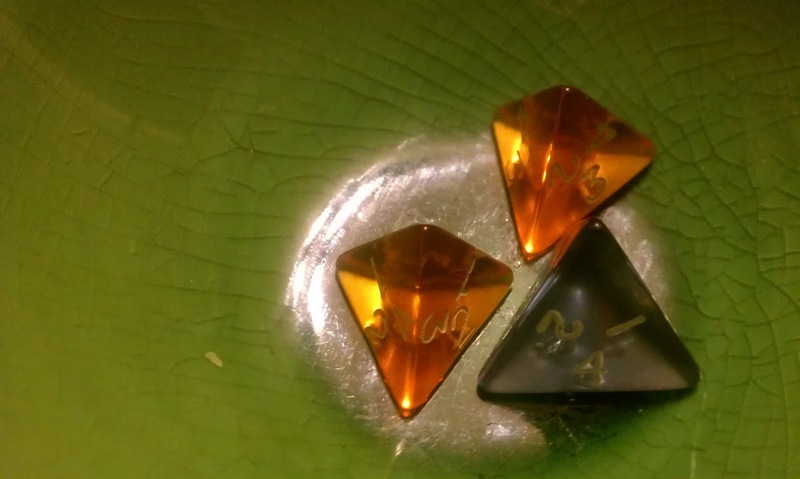 He drops his silver piece and rolls his three dice, resulting in "3," "3" and "4" and a score of "4." Crag wins and takes his silver. After many more hours and beers, Crag decides that its time to revisit the gambling table, but his lighter purse is making him less daring than before, so he opts in for a low stakes game. Crag plops down his penny ante and rolls his 3d4, but one of the dice slips out of the bowl. Crag rolled a piss on his first shot! Crag's First Roll: It's a Piss! Soily antes up (pot now 2cp) and rolls, getting a "1," a "2" and a "4" for no score. Crag antes again (3cp pot) and rolls a "1," a "1" and a "2" for a score of 2. Soily antes up (4cp pot now) and rolls "2," "3" and "4," a weal! Soily wins, takes the pot and Crag has to pay him 2 more cp (twice the ante). Crag, taught a bitter lesson, goes back to a game he can never lose: drinking! Soily's Second Roll: A Weal! So, this game is actually based on an old Asian game called Chinchirorin in Japan that I was introduced to by the Suikoden series of video games. I've changed it a bit here (obviously) to accommodate dice chain logic and the idea that increased risk means increased reward. I don't think that Edgar intended for me to actually create an in-world game, but here you have it. I'm already thinking about how to handle a more in-depth gambling game that would be approximated by DCC game mechanics for a higher-stakes game where fortunes would be won and lost over hours at the table. So yeah, that's coming. Eventually. Hopefully this will tide you over. Who Started the Fight at the Soiled Dove? What Happens When I Eat This Space Tentacle?